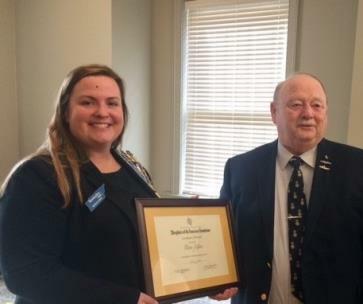 At the monthly meeting on March 13, members of the Nancy Ward Chapter presented Alan Syler with the Excellence in Community Service Award. After a career with the Navy and at TVA, Mr. Syler has spent his retirement as a member of countless veteran organizations. His passion is the Hamilton County Mentors for Vets. The group works closely with veterans having trouble with the court system. They are working to incorporate the group in the Hamilton County Mental Health Court. He recently got involved with “Get Veterans Involved.” This is a program that encourages local veterans to go into public schools to help build character and responsibility in youth. During the 2017 term, Mr. Syler served as chairman of the Chattanooga Area Veterans Council for Mayor Berke. Mr. Syler is also a proud member of the Tennessee Sons of the American Revolution, John Sevier Chapter. 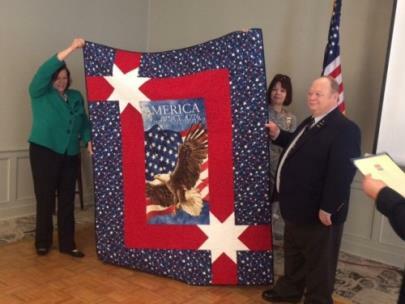 In addition to the award from the Chapter, Karen Downer with the Quilts of Valor Foundation gave a program on the organization and presented Mr. Syler with a quilt. Honoring veterans is one of the most popular and enjoyable missions of the chapter and the society, said officials.